"Review: Yes at the Symphony Hall, Birmingham"
Shouts of �we love you,� echoed around Symphony Hall as prog rock maestros Yes entered the stage. Striking white shoulder-length locks of at least three fifths of Yes for 2014 caught the eye as they returned to Birmingham as part of the UK stint of their world tour. The band, all in their 60s, apart from newest addition � sprightly 43-year-old singer Jon Davison � transported fans back to the 70s by playing arguably three of their greatest albums, in full. The shout outs were soon hushed as Yes kicked off with their genre-defining masterpiece Close To The Edge from 1972, with the confidence and precision only a band who have played songs from an album for more than 40 years possibly could. A splattering of hyperactive fans leapt out of their seats in appreciation as Siberian Khatru came to a close. �That was Close To The Edge performed from start to finish for the first time ever in Birmingham,� hailed bassist Chris Squire to thundering applause from the near-sell out audience. This 2014 incarnation of Yes includes three of the classic line-up in Squire, drummer Alan White, guitarist Steve Howe while Geoff Downes returns to the keyboards. But all eyes were on singer Davison. The American, who replaced Canadian Benoit David in 2012, sporting crimson red trousers and 70s shirt, brought his own brand of theatricality, as well as a Californian twang, to proceedings. Yes then cruised through Going For The One from 1977 bringing the house down again with 15 minute-plus epic Awaken before taking their much deserved 20 minute interval and retuning with The Yes Album from 1971. King of the strings Howe came to the fore for the full album finale blasting off the riff-laden Yours Is No Disgrace and seamlessly switching to acoustic to fans� favourite Clap before highlight of the night Starship Trooper saw the imperious figure of Squire strutting across the stage. More clapping from a now feverish crowd was to come as Yes sauntered through I�ve Seen All Good People and ending with A Venture and a rather fitting song title for Yes, Perpetual Change. It wasn�t long before Yes returned to the stage, however, ending the night with Roundabout from their 1971 album Fragile. Yes, those fans were right, what�s not to love? This was my 30th Yes concert (sad but I counted before I went) and it probably ranks in the top 5. I thought the show was excellent and so did my wife ~ not as much of a fan as I am. We both came out on a total high. This was my first seeing JD as the front man and I must say that he is very good indeed. He has personality and a good voice. 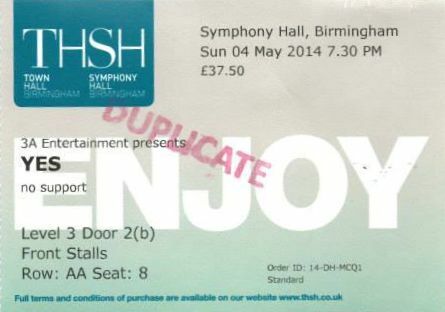 The band seemed very happy on stage together perhaps helped by the audience in a near full symphony hall. The others were equally excellent.